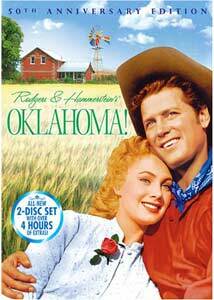 The first of the Rodgers & Hammerstein operettas, Oklahoma! is also one of their best. There's one great song after another, broad slapstick, wry and black humor, and plenty of dancing. The plot is a little thin beyond the central romance, but since when was plot very vital to a musical? The film version, independently produced by Rodgers and Hammerstein themselves, generates a good deal of suspense thanks to the darkly intense work of Rod Steiger. Curley (Macrae), a cowboy in Oklahoma Territory, is in love with Laurey (Shirley Jones in her film debut), a farm girl, at the turn of the century. Relations between the cowboys and the farmers were strained at best, as is made clear in the course of this film. The action centers around a "box social" at a nearby ranch. Curley is embarrassed to ask Laurey to attend with him, so she consents to go with the obsessive hired hand, Jud Fry (Steiger at his most threatening), just to spite him. However, Jud has a bad temper—today, he'd probably be called a "stalker." He also has been in love with Laurey for some time and is determined that no one else will have her—even if he has to kill her to make sure of it. Under Fred Zinnemann's direction, the cast puts in a highly energetic performance throughout. Zinneman was known primarily as a dramatic director, not a director of musicals, and he interestingly uses extremely long takes in the songs to emphasize the skills of the dancers. The dance sequences, choreographed by Agnes de Mille, are also energetic, although the central dream ballet seems to go on forever; one really needs the intermission when that's over. Although it's important to the film thematically, it should have been cut significantly because it really drags the picture down for a while. But the vitality of the cowboy dances more than makes up for the dullness of the dream ballet, most notably Gene Nelson's memorable dance at the railhead, climaxing with him dancing atop a moving train (and Shirley Jones reveals that he did it without a stunt man or special effects). The music is well performed throughout, although running the subtitles in tandem with the film will increase your enjoyment of the wit in the lyrics. Particularly noteworthy is the humorous Poor Jud Is Daid, where Curley suggests to Jud what his funeral might be like, if he were to die. There's dark double entendre, as Curley pretends to sympathize with Jud while actually mocking him cruelly. But there's also straightforward humor in the lyrics: "He looks like he's asleep/it's a shame that he won't keep/But it's summer, and we're runnin' out of ice." Other classics include Oh What a Beautiful Mornin', People Will Say We're in Love, I'm Just a Girl Who Cain't Say No and Things are Up to Date in Kansas City. There are many more that you're guaranteed to be humming afterwards. One of the very best movie musicals. One of the first films shot in large format Todd-AO, it was also shot with Cinemascope lenses. The two films are constructed out of different takes (one version was shot in the mornings, and the other in the afternoons), so the onscreen content is frequently different (though the pre-recorded songs are aurally identical in both versions). The two different versions are interesting for comparison's sake; you can see dance steps that are muffed in one version come through just fine in the other. The Todd-AO version is complete with the roadshow Overture, Intermission, Entr'Acte and Exit Music. Image Transfer Review: Disc 1 features the Cinemascope version of the film. It's almost by default a huge improvement over the old nonanamorphic version, with much more stable colors and far better detail. Unfortunately, some of the detail is artificial, with excessive sharpness enhancement making things have a digital edge that is rather unpleasant on a larger screen. It'll look wonderful on a smaller screen, though. Something must be dreadfully wrong with the source material on these films (a common mishap with independent productions), since there's little real detail or clarity in either version. The Todd-AO version is still fairly smeary and lacking in definition, natural or artificial; none of the legendary clarity of Todd-AO is on display here. When Shirley Jones talks in the commentary about the hairs on her face being visible in the Todd-AO version, the viewer here will be at a total loss as to what she's talking about since there's no texture or detail of any kind. These films ought to look magnificent, but there's still a great deal of room for improvement. Audio Transfer Review: Both films feature 5.0 and 2.0 English tracks. The 5.0 mix is quite enveloping, with a nice lush sound, though it does seem overly bright at times. It's too bad that the original 6-channel Todd-AO couldn't have been brought across, but this is a reasonably good substitute. The 2.0 audio is passable but nothing special. Hiss is prevalent on all tracks. Extras Review: The main attraction is a set of commentaries. The Cinemascope version sports musical historian Hugh Fordin talking about the history of the stage production and the film with Ted Chapin, president of the Rodgers and Hammerstein organization. They give a fine appreciation for the film but it's a little on the dry side and has a few quiet spots. More listenable is the commentary of star Shirley Jones on the Todd-AO version, which features plenty of recollections from the shoot and her long friendship with Gordon Macrae. She's quite animated and happy to talk, and it's a very enjoyable commentary. There aren't any documentaries directly devoted to the film proper, but there are some materials devoted to the Todd-AO process. A featurette (12m:06) compares the Cinemascope process to the large format 70mm Todd-AO. Two promotional films, The Miracle of Todd-AO (11m) and The March of Todd-AO (16m:58s) give a sense of how the process was marketed to the public. The former featurette was shown to audiences as part of the presentation of the feature, with the standard roller coasters and nature photography. The other film features flight with a navy plane, the Brussels 1958 World's Fair, and the election and coronation of Pope John XXIII in the Vatican. These suffer much of the same lack of detail as the feature, making one wonder whether the detail is being lost in converting a film intended to be seen on a massively curved screen to a flat version. A modern re-release teaser is rather dispensable, but the original vintage trailer (found only on the Todd-AO disc, even though it's a trailer for the Cinemascope version) is a much more effective piece of period salesmanship. Two excerpts from a live 1954 television tribute to Rodgers and Hammerstein provide performances by Macrae and a completely unrecognizable young Florence Henderson. This is interesting in part for the use of a re-creation of the original minimalist stage settings and costumes. A gallery of 25 behind-the-scenes shots is mildly interesting, but the 'gallery' of lobby cards and posters is a stingy set of two ads and one lobby card. Finally, there are singalong versions of the songs and the option to play all of the songs in succession is certainly welcome for the wannabe vocalist. A classic piece of Americana that is driven by magnificent performances of great songs. It took six years for Fox to upgrade its wretched nonanamorphic DVD with a proper special edition; while the Cinemascope version is a huge upgrade, the Todd-AO version is still something of a mess. Perhaps they'll finally get it all right for Blu-Ray in another six years.